Confidentiality of information should be preserved despite the emergence of data outsourcing. An existing approach is supposed to achieve confidentiality by vertical fragmentation and without relying on encryption. 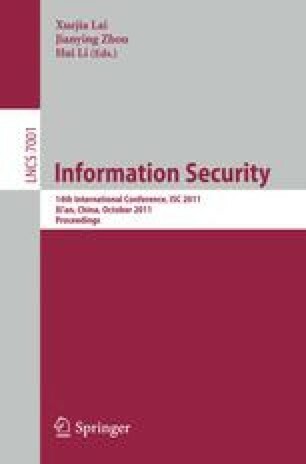 Although prohibiting unauthorised (direct) accesses to confidential information, this approach has so far ignored the fact that attackers might infer sensitive information logically by deduction. In this article vertical fragmentation is modelled within the framework of Controlled Query Evaluation (CQE) allowing for inference-proof answering of queries. Within this modelling the inference-proofness of fragmentation is proved formally, even if an attacker has some a priori knowledge in terms of a rather general class of semantic database constraints. This work has been partially supported by the DFG (SFB 876/A5), and a postdoctoral research grant of the German Academic Exchange Service (DAAD).